Ready. Set. WRITE! 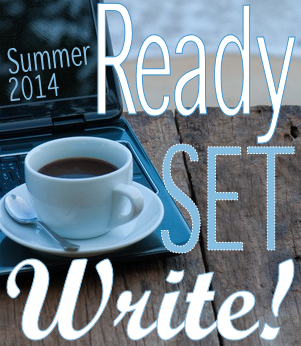 is an online writing intensive to help stay accountable with your writing goals over the summer and provides an opportunity for us to cheer each other on whether planning, drafting, or revising! Your RSW hosts are Alison Miller, Jaime Morrow, Erin Funk, and Katy Upperman. Find the rest of the details HERE. I missed last week because I had just arrived in NYC and forgot! But I set some goals on my What’s Up Wednesday post. ~ This was a serious goal for me. I am not good at in the moment living. I managed it well I think. ~ So much. I did some revising too. Went to a cafe, had a bagel, and actually wrote a whole new chapter. Also, saw writing friends which aided in the inspiration. 3. Be in love with my characters. Be in love with this city. Be in love with my husband. ~ Yes to all of the above. But very glad to be home with my kid. Myself. In my own way and stubborn. That the book I want to write is in there, that I know what that book is, and that I can see how to shape it. 1. Finish the book I am reading right now and start another one. 3. Write 8 screenplay pages. 4. Do something fun on Friday with my son, just us. Love your excerpt, Rebekah! Sweet, romantic scenes are my favorite, and that’s the vibe I’m getting from what you shared. Best of luck with your goals this week, lady! I like that you added in life goals, very important. I agree, living in moment is tough when we have handheld devices with so many distractions, or plainly, the Internet. Yay, Rebekah! It seems like even though you were traveling and living in the moment, you still managed to do some good work. Your post this week is so grounded and levelheaded. It’s making me take a deep breath. Love the lines you shared, Rebekah! I sense some swoon-y vibes there, though I could be wrong. 🙂 I’m so impressed that you wrote a chapter while you were away! I fully intend to shelf anything writing-related until I’m home from my trip. I’m not very good at squeezing in writing unless I’m home at my computer. How awesome that you have a clear idea of what your story needs to be and how to get it there. Can you send some of that my way, please? 😉 Have a great week! Love your excerpt that you shared. I want to go to a cafe or the magic Panera bread that all these writers talk about on Twitter. I would love for it to work for me. I think I need a change of scenery. Good luck with your goals this week! All your goals from last week resonated with me so much. I’m not good with “in the moment living” either, but it sounds like you’ve been doing pretty well at it lately. I love the line you shared too, and it really makes me want to know what “it” is that he’s referring to. Hope meeting your goals goes smoothly this week and that you have a wonderful time with your son on Friday! I am still fine-tuning the revision plan, tweaking it as I work on these opening chapters. But I am really excited about these opening chapters. It’s funny, because before I went to New York I was not excited about revising. I think New York helped. I cannot wait to show you everything too! Yay for renewed excitement! I’m happy you are diving into it and that you’re liking what you’re doing to it. And it sounds like you had a lovely week! With productivity too! I wish you more of that in the weeks to come!